Clarett USB lays down the challenge to interfaces twice the price and brings the Clarett sound to both Mac® and PC over USB. The range features specially designed high performance, low-noise (-128dB EIN) mic pres with a low distortion, ultra-linear design that guarantees a clean, open and transparent sound, giving accurate representation of the original performance. Record every detail with Clarett 8Pre USB. Clarett 8Pre USB is an 18-in, 20-out audio interface. Six-segment LED metering easily shows the signal level of the eight mic/line inputs, two of which are also high-impedance instrument inputs that can record super-hot pickups with no unwanted distortion. Analogue outs include two monitor outputs with anti-thump technology, eight line outputs, two headphone outputs with volume controls, and a word clock output for sending clock signal to external devices. MIDI I/O and S/PDIF I/O are also included. ADAT I/O allows you to expand your setup with up to eight extra inputs and outputs when combined with multi-channel mic preamps like Clarett OctoPre. The Air-enabled mic preamps can reproduce the input impedance, clarity and frequency response curve of our original ISA mic preamp. Now you can choose. With or without Air. Decades of analogue circuit design experience, applied around 24-bit/192kHz A-D and D-A conversion, delivers a superior signal path boasting 119dB dynamic range. Hear your music sound better than you've ever heard it sound before. 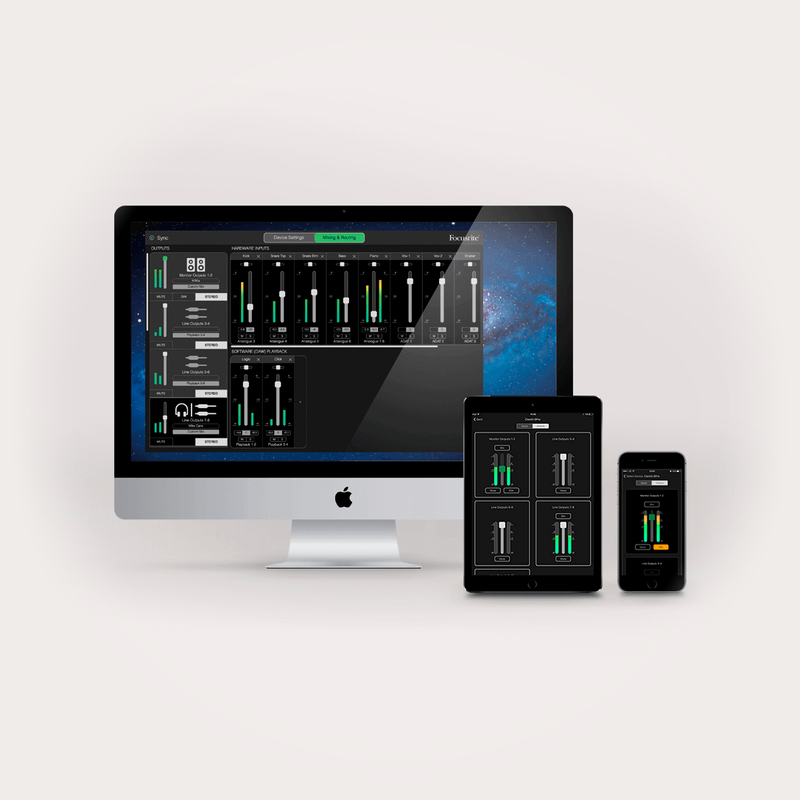 Configure your routing and monitor mixes from Mac®, PC, iPad®, iPhone® or iPod touch® with user-friendly control software Focusrite Control. Find out just how easy it is to set up your Clarett 8Pre USB. We always quote ‘real world’ performance figures (measured to the AES17 standard). Some companies choose to quote chipset performance, which is misleading and here's why.